If you put any group of chemists together for any length of time, lab horror stories will start to creep out. We’ve all heard them, as colleagues compete with each other to claim the worst near-disaster in the lab: ‘In a moment of madness I poured water down the spout which caused a fireball to rush straight past my head’; ‘I poured the entire bottle of calcium into the bucket of water shortly before realising this one was fresh’; ‘That was when I learned that you should not open a bottle marked “lachrymator” on the bench…’ These are all real examples – specifically mine! I’m guilty myself, the proud owner of many a tale polished to perfection. However, these days I increasingly feel uncomfortable, irritated and concerned when I read stories such as last month’s Last retort about a lab accident (Chemistry World, May 2018, p72). We seem to glorify blind luck whereas health and safety is demonised. I used to see occupational health and safety officers as interfering, bureaucratic busybodies whose sole purpose was to stop the rest of us from doing things. Then, entirely by accident, I drifted into the job myself. I was looking for something more fulfilling than the endless washing up in the teaching lab, and asked if there were any other jobs going. ‘Help the health and safety officer with waste disposal? Sure, sounds great.’ All of a sudden, without really realising it, I had joined the ranks of those interfering, bureaucratic busybodies too. Such caricatures miss the point. Chemistry is fundamentally hazardous. Solvents will always be flammable, extreme reagents will always be needed for extreme reactions and the list of what causes cancer grows daily. As the 19th century organic chemist August Kekulé said: ‘If you want to be a chemist… you have to ruin your health. Who does not ruin his health by his studies nowadays will not get anywhere in chemistry.’ No one in their right mind works in a deliberately unsafe manner now. 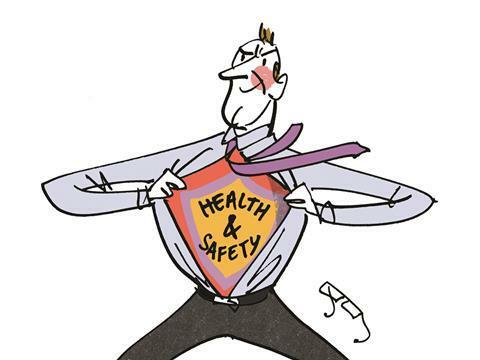 Health and safety is the reason we’re able to do our jobs and still live long, healthy lives. So why do we still tell tales of fire and explosion with such relish? It’s because accidents happen. Chemicals get neglected in the back of cupboards and decompose into peroxides; Winchester bottles get dropped; undergraduates get trusted with the expensive equipment. These stories are exciting to tell once the hazy spectacles of hindsight are applied. It’s easy to forget that these are usually the stories in which no one got hurt – and the chance to learn from our mistakes gets lost in the blow-by-blow accounts of daring do. Which brings us back to health and safety. In the aftermath of an incident, it is hard for us not to be painted as the bad guys. But our strength isn’t about investigation: it’s in trying to make sure the next accident never happens in the first place. We push paperwork because it is the only way we can be certain that someone has actually thought about safety (you probably would have done it anyway, of course, but a lot of people wouldn’t). Perhaps it is hard to see the value when, for an entire generation, safety at work has been the norm. But if you take a look at the UK Health and Safety Executive’s statistics, you’ll see how injuries and fatal accidents have plummeted since the 1960s. We are simply not used to realising that we can come to serious harm. Should we continue to tell lab horror stories? Of course! They are an integral part of what binds communities of chemists together and, if nothing else, provide entertainment for the listener. My only request is that next time you spin a yarn, don’t make health and safety the bad guy. If you put any group of chemists together for any length of time, lab horror stories will start to creep out. We’ve all heard them, as colleagues compete with each other to claim the worst near-disaster in the lab. Below are all real examples – specifically mine! Which brings us back to health and safety. In the aftermath of an incident, it is hard for us not to be painted as the bad guys. But our strength isn’t about investigation: it’s in trying to make sure the next accident never happens in the first place. We push paperwork because it is the only way we can be certain that someone has actually thought about safety (you probably would have done it anyway, of course, but a lot of people wouldn’t). Perhaps it is hard to see the value when, for an entire generation, safety at work has been the norm. But if you take a look at the UK Health and Safety Executive’s statistics, you’ll see how injuries and fatal accidents have plummeted since the 1960s. We are simply not used to realising that we can come to serious harm. Should we continue to tell lab horror stories? Of course! They are an integral part of what binds communities of chemists together and, if nothing else, provide entertainment for the listener. Every excerpt within this article is from one of my own horror stories which I will continue to tell. My only request is that next time you spin a yarn, don’t make health and safety the bad guy.